The Central Information Commisioner Prof M Sridhar Acharyulu directed the Ministry of Environment and various public sector undertakings like ISRO and BARC to explain whether they have implemented the directions of the National Green Tribunal in protecting the Amrit Mahal Kavals grasslands in Karnataka. Mr. Acharyulu also directed the Ministry to compensate appellant by paying Rs 10,000 for undue denial, delay and unreasonable claim of exemption. The appellant Davis George Thomas was seeking information regarding the details of the agencies/projects in the lands ofAmritMahalKavals, ChallakersTaluk, Chitradurga District, Karnataka. As no information was received he approached the Commission in second appeal after exhausting the first appeal. The Environment Support Group (ESG), to which appellant also belonged, has filed Applications No. 6/2013 and 12/2013 before the National Green Tribunal highlighting how various public sector and private enterprises have commenced work in total disregard of Environmental laws, norms and clearance procedures. The NGT issued certain directions to Ministry of Environment protect the AmritMahalKavals lands. Appellant sought to know whether NGT order was implemented. Amrit Mahal Kavals of Challakeretaluk of Chitradurga district constitute a criticial component of the last few remaining flagship faunal species of grasslands ecosystem in India. Appellant alleged there was very little understanding of the floral diversity of such ecosystems. During 2008-10 the Government of Karnataka through the office of the Deputy Commissioner of the Chitradurga District began to divert almost all the AmritMahalKavals in ChallakereTaluk to a variety of urban, industrial, infrastructure development, research and defence related projects without consultation process of any kind. Appellant alleged that for seven projects 9273 acres of forest land was diverted for non-forest purposes and allocated for various activities as per confirmed figures besides 10000 acres are being converted to station Indian Army, which is to be confirmed. Karnataka State Pollution Control Board issued a Notice on 12th April 2011 for starting the projects without CFE and directed to start process of taking consent for establishment CFE from KSPCB immediately. Such notices were issued to occupiers such as ISRO, Indian Institute of Science IISC, Chitradurga, Bhabha Atomic Research Centre BARC, Aeronautical Development Establishment ADE, M/s Sagitaur Ventures Pvt Ltd, Bangalore, etc. High Court of Karnataka in writ petition 17954/1997 directed to protect these lands and no portion of that land in any way be diverted or illegally encroached upon. This was not appealed and thus became final and binding. Karnataka state law department rightly opined that this order binds the state including all its departments. High Court confirmed this aspect and thus the Amrit Mahal Kavals Gomala lands need to be protected. NGT directed that “the grasslands have to be protected as a wild life habitat. ....It becomes imperative to recognize the ecological, hydrological, economic and sociological role of grasslands as source of survival for millions of livestock and rural people..... Bustard species can be considered as indicators of grassland ecosystem and by conserving the bustards and their habitats, a large number of species that are dependent on the healthy grasslands can be protected. Keeping in view that these magnificent birds are now on the verge of extinction, there is an urgent need to launch Project Bustards and immediately provide all the necessary steps to ensure their survival....It becomes necessary to issue directions to the Government of Karnataka to preserve and maintain the remaining area of AmritMahalKaval lands in Chitradurga district without any diversion, thereby enabling the villagers around the Kaval lands to use the same as they have been used by them in the past”. NGT further directed:In view of fact that Amrit Mahal Kavals lands are shrinking and only a small extent remains, the Government of Karnataka is directed to firm up and finalize action plan for the protection and conservation of the said endangered species and initiate time bound execution of the plan forthwith. In this exercise, the Government of Karnataka is also directed to ensure proper and timely coordination amongst concerned departments and agencies to achieve the planned objectives. The law mandates that without obtaining the prior environmental clearances and prior consent for establishment the project proponents should not commence any activity connected to and concerned with the establishment of the project. ..it is made clear that both BARC and ISRO shall proceed with the activities either constructional or otherwise on establishment of respective projects only after obtaining environmental clearance from MoEF and consent for establishment from KSPCB, the NGT said. Karnataka Government is restrained from making any further allotment in AmritMahalKaval lands in Chitradurga district to any one on any reason or for any purpose. The MoEF to provide comprehensive information as to implementation of the directions of the NGT in paragraph 181 stating: Bustard species can be considered as indicators of grassland ecosystem and by conserving the bustards and their habitats, a large number of species that are dependent on the healthy grasslands can be protected. Keeping in view that these magnificent birds are now on the verge of extinction, there is an urgent need to launch Project Bustards and immediately provide all the necessary steps to ensure their survival.Whether MoEF has launched project Bustard? If so details of the same and if not the reasons for the same shall be explained in a note to the applicants and same shall be placed on official website. The Government of Karnataka to explain what measures it has taken to implement the orders of NGT in paragraph 199 referred above to preserve and maintain the remaining lands of AmritMahalKaval and whether it has refrained from allotment of further lands in AmritMahalKaval, whether any orders prohibiting allotment was issued, if so the copy of the same, if not, reasons. The Government of Karnataka to explain whether the direction of NGT “to firm up and finalize action plan for the protection and conservation of the said endangered species and initiate time bound execution of the plan forthwith. In this exercise, the Government of Karnataka is also directed to ensure proper and timely coordination amongst concerned departments and agencies to achieve the planned objectives”, is implemented, whether action plan is firmed up and finalized, if so details with concerned documents and if not why, the reasons shall be explained. In view of direction: ‘Karnataka Government is restrained from making any further allotment in AmritMahalKaval lands in Chitradurga district to any one on any reason or for any purpose. Para 212”, the Government of Karnataka to inform how they are implementing this direction. In view of the observation “... it is made clear that both BARC and ISRO shall proceed with the activities either constructional or otherwise on establishment of respective projects only after obtaining environmental clearance from MoEF and consent for establishment from KSPCB (Paragraph 205)”, whether BARC and ISRO obtained necessary clearances and consent? The BARC and ISRO are directed to provide information along with the necessary copies of documents. The MoEF is directed inform whether BARC and ISRO obtained the above referred clearances and consent. In view of the direction of NGT: “Both MoEF and KSPCB are directed to strictly comply with the observations and also the directions given to them at the time of grant of Environmental clearance and or Consent for Establishment as the case maybe”, the MoEf and KSPCB to inform what measures they have taken to implement this direction? Any specific notification issued, if yes, the copy of the same, if not the reasons. The MoEF and KSPCB to inform how they are implementing direction of NGT in paragraph 215 point 1. Whether MoEF revisited the exemption deemed to have been given to M/s Sagitaur Ventures India Pvt Ltd and passed suitable orders as per Point 1 in Paragraph 215.
th June 2011 issued by MoEF. The KSSIDC and IISc to inform whether they are permitting the villagers to offer pooja, celebrate festivals and conduct traditional rituals on concerned days at the temples located in the sites allotted to them during and even after their establishment and subsequent operation, how are they doing it, have they notified the same in Kannada language and the language which the people of locality understand, is there any oral notification? KSSCIDC and IISC to provide proof of the participation of the people in above referred activities regularly. The BARC to inform whether they shifted the temporary fence and opened up a passage to the villagers as directed by NGT in point 5 paragraph 215, provide the proof of the same. The BARC and IISc are to inform whether they have evolved joint action plan and how they implemented that to enable free movement of villagers from Khudapurato Old Sheep farm through their respective premises. The ISRO to inform whether they are providing water to the villagers of Ullarti village through the borewells located in the site allotted to them, on a continuous basis. Commission directs them to facilitate inspection to appellants, who in turn are directed to report their findings to the Commission in a month. The Commission finds it absolutely irrelevant and non-applicable the claim of the respondent authority that information sought is barred from disclosure under Section 8(1)(a) stating that it would impact the strategic security installations of the nation. They have not shown any evidence or convincing reason to show how disclosure of this information about implementation of NGT order affects security interests of the nation. It is ridiculous that MoEF did not understand the implication of their claim of this exemption. How can informing about implementation of environmental protection order of NGT affect the security of the country? The orders of NGT are so clear and specific that they pertain to various rights of the people. It is surprising that well educated CPIOs who are senior Scientists in Environmental sciences have taken this stand without applying their minds to the rights of the people and environmental degradation. The Commission records its displeasure. 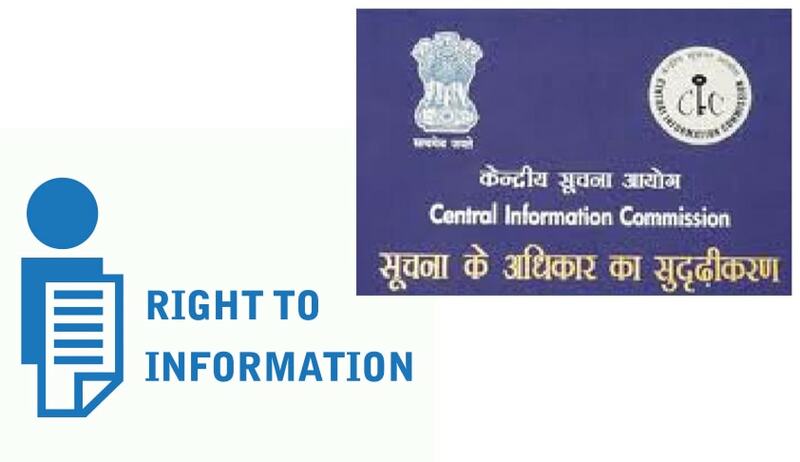 The Commission observers that the information sought was unduly delayed by the MoEF raising irrelevant grounds, the Commission, in exercise of its powers under Section 19(8)(b) directs the MoEF to pay Rs 10,000 as compensation to the appellant and recommend not to claim serious exemptions without any seriousness, just to block the information sought as they did in this case and train their CPIOs properly to prevent such inordinate delay in disclosure like this.